Bst 2.0 WarmStart DNA Polymerase is an in silico designed homologue of Bacillus stearothermophilus DNA Polymerase I, Large Fragment (Bst DNA Polymerase, Large Fragment) with a reversibly-bound aptamer, which inhibits polymerase activity at temperatures below 45°C. The aptamer rapidly releases the Bst 2.0 WarmStart DNA Polymerase above 45°C and therefore no special activation step is needed to activate the polymerase. Bst 2.0 WarmStart DNA Polymerase contains 5´→3´ DNA polymerase activity and strong strand-displacement activity but lacks 5´→3´ exonuclease activity. Bst 2.0 WarmStart DNA Polymerase displays improved amplification speed, yield, salt tolerance, and thermostability compared to wild-type Bst DNA Polymerase, Large Fragment. Identical LAMP reactions were run either immediately after setup (solid line) or after a 2 hour incubation at 25 °C. Without the protection from Bst 2.0 WarmStart, this room temperature incubation results in variable LAMP performance. 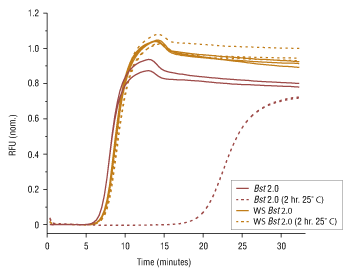 Bst 2.0 WarmStart provides more consistent amplification reaction and enables room-temperature and high-throughput setup. Bst 2.0 WarmStart DNA Polymerase is prepared from an E. coli strain that expresses the Bst 2.0 DNA Polymerase protein from an inducible promoter. Bst 2.0 WarmStart DNA Polymerase does not exhibit 3´→ 5´ exonuclease activity. Bst 2.0 WarmStart DNA Polymerase cannot be used for thermal cycle sequencing or PCR. Specific reaction conditions will vary for differentisothermal amplification applications. For best results, use 1X Isothermal Amplification Buffer. WARMSTART® is a trademark of New England Biolabs, Inc.